This entry was posted on November 7, 2014, in Information, New Owners, Rules & Regulations. Bookmark the permalink. Updates to the Parking rules and the Co-Owner Responsibility Matrix are now available and have been mailed to all co-owners. The first notice in the mailing pertains to the use of garages and parking rules. 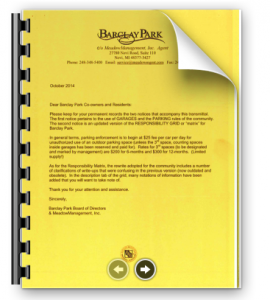 The second notice is an updated version of the Responsibility Grid or “matrix” for Barclay Park which should clarify a number of items that were confusing in the previous edition. Note: further updates to Responsibility Matrix were made in January 2015, and it is available below as well.